About: Vanilla is a standards-compliant, multi-lingual, fully extensible Web discussion forum (PHP >= 7.0 & MySQL). Sources. Doxygen doesn't incorporate all member files but just a definable subset (basically the main project source code files that are written in a supported language). So to search and browse all member files you may visit the Fossies vanilla-Vanilla_2.8.1.tar.gz contents page and use the Fossies standard member browsing features (also with source code highlighting and additionally with optional code folding). Vanilla was born out of the desire to create flexible, customizable, and downright entertaining community solutions. Vanilla has been used to power tens of thousands of community forums around the world and we couldn't be happier if you've decided to use Vanilla to grow yours. Every community is unique. Vanilla is a finely-crafted platform on which designers and developers can build a custom-tailored environment that meets your community's particular needs. 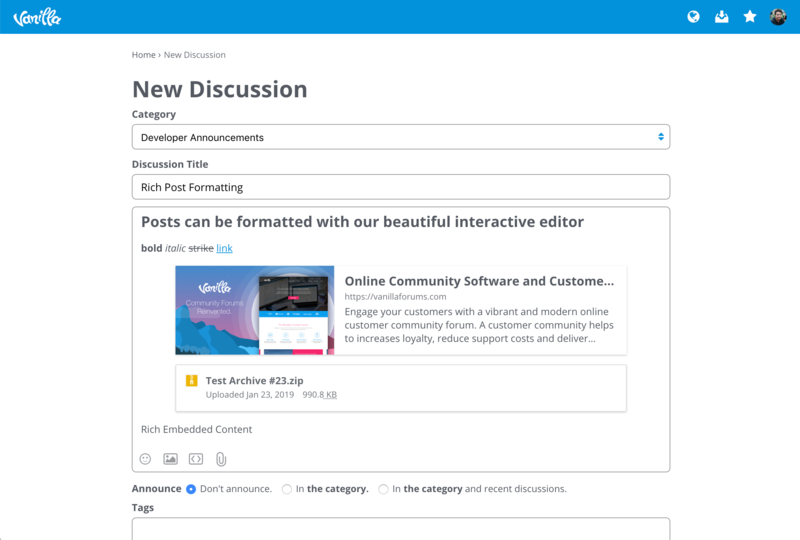 We've reimagined traditional forums for mass-appeal. Our theming flexibility is second-to-none. Impossibly good integration options with single sign-ons and embedding. 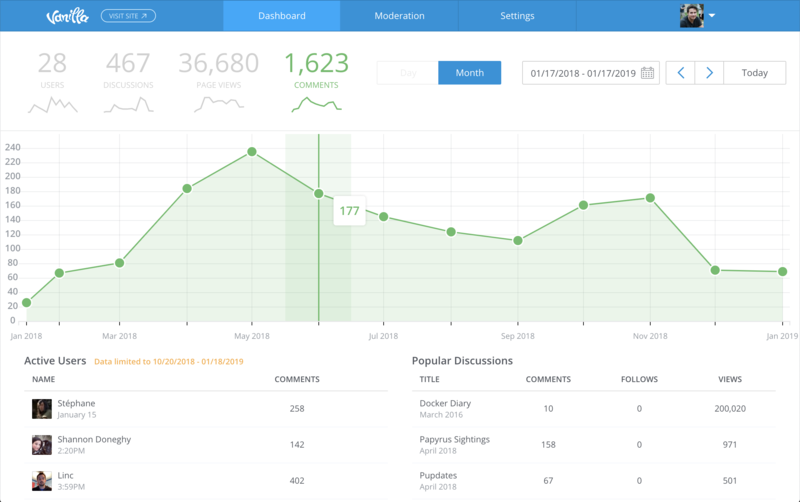 The best tools available for community management. Curated features with great plugin options, not the kitchen sink. Upgrading from an earlier version of Vanilla? See our upgrade notes. Local Development - Environment, Configuration & Debugging & Build Tools. https://github.com/vanilla/vanilla/issues/new?template=bug_report.md "File a detailed bug report"
https://github.com/vanilla/vanilla/issues/new?template=new_feature.md "Plan out a new feature"
Please disclose security issues responsibly by emailing suppo.nosp@m.rt@v.nosp@m.anill.nosp@m.afor.nosp@m.ums.c.nosp@m.om with a full description or join our bug bounty program. We cannot award bounties outside that program. We'll work on releasing an updated version as quickly as possible. Please do not email non-security issues; use the issue tracker instead. The master branch is considered a stable branch capable of being released at any time. Reviewed, stable changes land against master via pull-request. The release/2.x.dev branches are production-ready branches for our cloud product but are not yet vetted for open source release (alternate platforms & configurations). Our open source release branches are named by version number, e.g. release/2.6. We begin release branches with a dev (dev.#) designation and progress them through release candidate to stable. 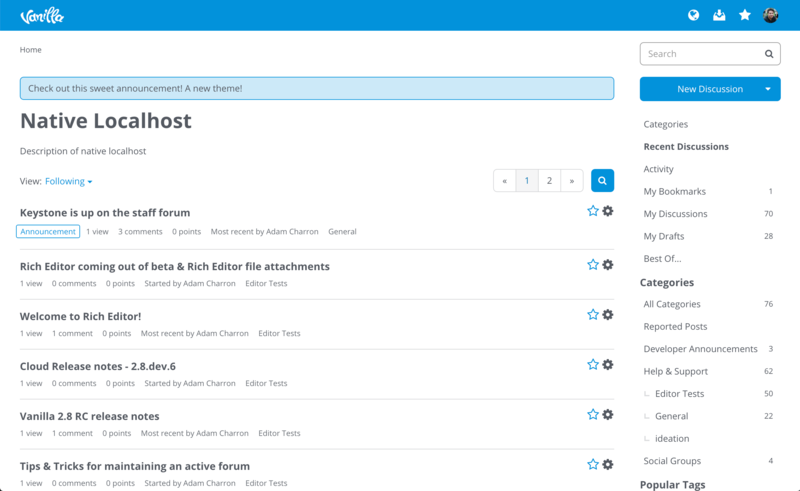 Refer to the OSS changelog and the Vanilla Cloud changelog to track active changes between releases. Vanilla releases are built using Phing to create a pre-built deploy-ready copies of Vanilla. To build these run the following in the root of the repository. The following dependenies are all required for building a release. Vanilla is free, open source software distributed under the license gpl-2.0-only. We accept and encourage contributions from our community and sometimes give hugs in return. Copyright © 2009-2019 Vanilla Forums Inc. Vanilla Forums is free software: you can redistribute it and/or modify it under the terms of the GNU General Public License as published by the Free Software Foundation, either version 2 of the License, or (at your option) any later version. Vanilla Forums is distributed in the hope that it will be useful, but WITHOUT ANY WARRANTY; without even the implied warranty of MERCHANTABILITY or FITNESS FOR A PARTICULAR PURPOSE. See the GNU General Public License for more details. You should have received a copy of the GNU General Public License along with Vanilla Forums.